Fill Out This Form and Claim Your Free Download! Is your dad experiencing a decline in health after a major medical event like a stroke? Did your mom receive a memory loss diagnosis, and now you have concerns about her ability to keep driving long term? Has managing medications and maintaining the house become difficult for your parents? Are your parents just ready to enjoy the luxuries of senior living? With many assisted living options available throughout the United States, the sheer amount of choices can seem overwhelming. We realize this is a big decision and hope that this guide can give you a glance into the team members, programs, and our unique approach to assisted living and memory care. It’s our passion that drives us to do all we can to change the lives of older adults for the better each and every day. With more than 28,000 assisted living residences in the U.S., looking for the right one can seem overwhelming, but it doesn’t have to be. “It is about finding the best fit, and finding the best fit starts with finding the community with the best ‘feel,” says Tiffany Van Heel, Marketing Coordinator for Highgate Senior Living. The key is to start your search early. Fill out this form and get your free copy of How to Find the Best Assisted Living Facility. 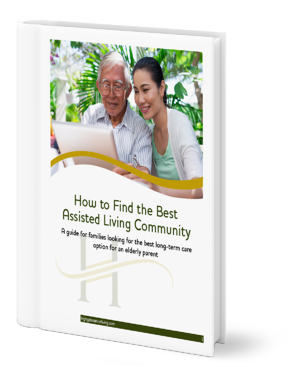 Download ‘How to Find the Best Assisted Living Community’ Today!